Shopping is serious business in Singapore. Once a year, the city hosts the Great Singapore Sale, and visitors flock from around the world to seek out bargains. 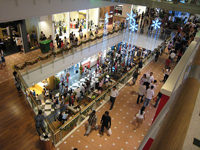 Most people recommend starting any shopping trip on Orchard Road, and branching out into various local neighborhoods. In Singapore food is a major event. 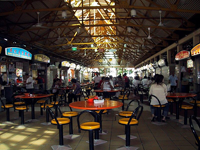 Unlike many cities, food stalls in Singapore are hygienic and carefully monitored for food safety. Wander around the Maxwell Road Hawker Center and be amazed at the variety of food on offer. 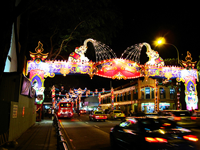 Chinatown is the historical center of the Chinese population in Singapore. Listen to the sounds of cantonese while discovering traditional shophouses and eating exotic chinese delicacies. Stop into a tea house after visiting the exhibits at the Chinese Heritage Center. If you are up late, pick up some traditional chinese handicrafts at the Chinatown Night Market on Pagoda Street. Bright colors and spices fill the streets of Little India. It is easy to walk down Serangoon Road and forget that you have not been transported to India. Soak up the atmosphere, and duck into an Indian restaurant for an enjoyable meal. Vegetarians will be especially well served in Little India. Visit the Sri Veerama Kaliamman Temple for its sculptures and colorful Hindu ceremonies. You might want to stop into the Mustafa Center for some shopping. The mega-mall is known for being the place where you can buy almost anything. Open only at night, the Night Safari is the worlds first open-air, nocturnal zoo. The Night Safari is located next to the regular Singapore zoo on 40 hectares of rainforest. Over a thousand animals are housed in the zoo and many of them are rare and threatened species. The animals are not caged. Instead, they are separated from visitors by natural barriers such as moats. Families and animal lovers will certainly enjoy the experience. 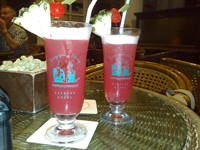 The iconic Singapore Sling was invented sometime near the beginning of the twentieth century by a bartender at the Long Bar in the Raffles Hotel. The historical Raffles Hotel along with the Long Bar are still in operation today. Step into the renovated hotel and enjoy a cool Singapore Sling after a long day of exploring. Take a break from the city and heat by treating yourself to some pampering at the spa. 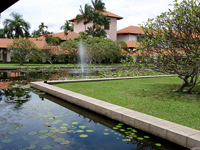 Most high-end hotels offer excellent treatments and there are also spa resorts such as the Sentosa Spa. In the early morning, most businesses are closed in Singapore. This makes it the perfect time to visit the Botanical Garden, which opens at 5am. The garden is particularly known for its orchid collection. Enjoy the asian collections at the National Museum, or for a change of pace, consider the Red Dot Design Museum located in the former home of the Singapore traffic police. The Universal Studios theme park is the only one of its kind in Asia. Families will enjoy a day riding the top-quality attractions and exploring the themed resort. This article was written by Natasha Tasha, on behalf of Escape Travel, Australia, offering great selection of cheap flights to Singapore.